The psychology of mistaken-for-game hunting accidents is fascinating and sometimes counter-intuitive. It’s tempting to attribute negative characteristics (carelessness, negligence, stupidity) to the shooters involved and say to oneself, “That’d never happen to me, I always identify the target, I’ve never shot anyone, I’m safe!” But the fact is many of the people who’ve caused hunting accidents had exactly the same mindset—until the time of their accident. Afterwards they simply can’t explain what went wrong, and the people who know and respect them are left scratching their heads in disbelief. As a hunter becomes more successful over time, his mind unconsciously reinforces behaviours that lead to success, and ignores behaviours that don’t. As his competence and experience grows, he assumes his safety improves also, but in fact the opposite can be true. While the hunter thinks he continues to behave deliberately and carefully, he can unconsciously be slipping into less safe practice. In a worst-case scenario situation this can result in an accident. To the hunter and those who know him, it comes as complete shock. Many mistaken-for-game hunting accidents are caused by hunters who were considered safe and competent. In their mind they 100% believed they had identified the target beyond doubt. Heuristics and cognitive biases are unconscious mental short-cuts that allow us humans to function quickly and efficiently in day-to-day life. The downside is that they also have the potential to cause serious error, and they play a significant role in most mistaken-for-game hunting accidents. 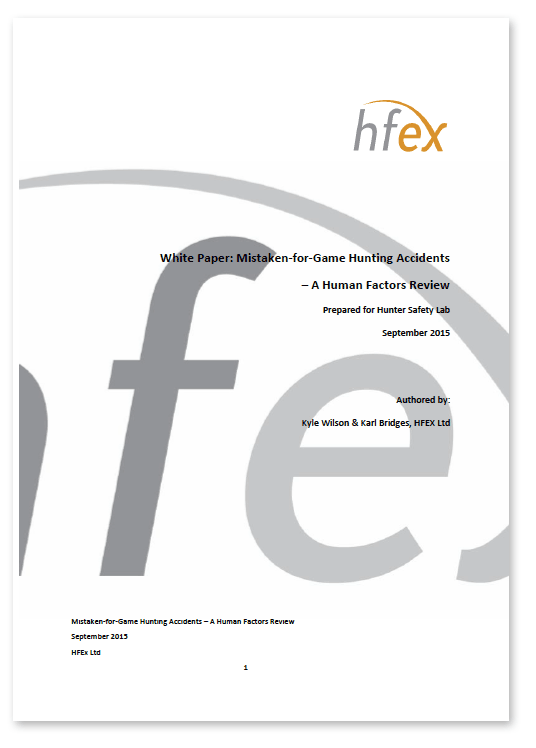 Wilson & Bridges—two human-factors psychologists—have written a paper titled “Mistaken-For-Game Hunting Accidents – A Human Factors Review”. This paper provides a detailed insight into the unconscious factors that contribute to many mistaken-for-game hunting accidents, and explain why these accidents can be impossible to guard against without an external, impartial intervention. For further reading on the role unconscious error plays in accidents, also have a look at Dr Marc Green’s website which gives an explanation of ‘inattentional blindness‘ and how it contributes to seemingly inexplicable accidents in industries such as medicine, aviation and transport. Henry Worsp – outdoor safety professional, qualified paramedic, hunter for 17 years. “In so many of these shootings the shooter does identify his target 100% (in his mind), he knows 100% that it’s a deer, can clearly see it’s a deer, even count the points, even watch it for 10 minutes (yep it’s happened!) , then shoots his mate! He’s not an idiot at all, the mind plays tricks and the more hunting you do the more likely you will make a mistake. It can happen to anyone.” Martin Askes -Former Editor NZ Outdoor Hunting Magazine.